Ah, the sweet trappings of success. Hannah has come quite a long way from her season-one iteration, which was a groveling, broke girl living with Marnie. She's got a real-deal paycheck (note to starving writers: sponsored content is indeed a good way to make a buck), bought herself a nice dress, and also is finally experiencing the life she has always wanted. Or, rather, "the life she has always wanted," because suddenly, there she is, in the Gramercy Hotel, and her biggest problem is that she is too successful. People are doing too well. Something has got to give. 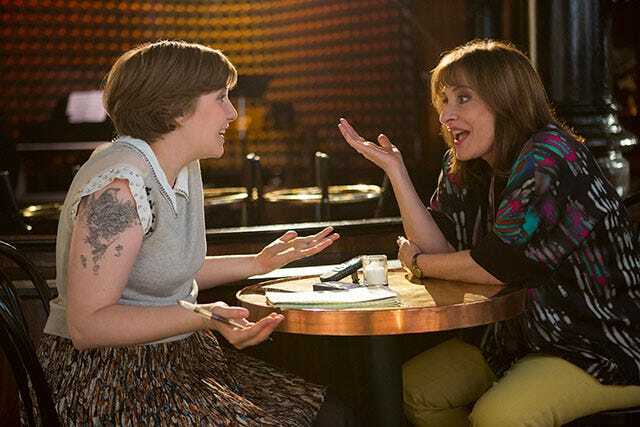 There is never too much Patti Lupone, and while Hannah has the interviewing skills of a third grader, just seeing her and Lena Dunham interact was wonderful. (Another note: Hanny really needs to figure out when it is appropriate to pick up a phone. This has been bothering me for several episodes now, and it is really frustrating.) I was watching the show with someone who hasn't engaged with all the Jezebel back and forth or blog discussions about who Lena Dunham is and what she is known for, and she remarked how charming Hannah can be. It is frustratingly true. Dunham as Hannah has these brief moments of likeability that salvage her as a character — the times where she seems engaged and intelligent instead of absorbed and blockheaded. This scene exemplified the sweetness that makes Marnie and Adam stick around for more. Poor, bored, gorgeous Jessa receives a visit from her creepy rehab dad, and instead of spouting all of the wonderful rehabisms she had from last week, she took two seconds to resort back to her partying ways. Or "partying ways." The way that this show has handled her rehab storyline has been really frustrating and a downside of the season. First of all, the depiction of the wild, bohemian spirit is rarely presented without a heavy dose of substances, but more troubling, as I have pointed out, her rehab stint is positioned as a joke. Secondly, before the beginning of this season, we had no idea Jessa was an addict. Sure, she is crazy and bizarre, but Hannah put it best when she identified her as a "life addict." Seeing Jessa on a cocaine binge feels...preachy? Especially since last season had Hannah experimenting with cocaine in a very honest way. This seems like a roadblock in the Jessa narrative that is great for character-building, not a real look at addiction and its terrible consequences. Addiction is a real disease, whereas Jessa seems to wear hers when it suits her. (I don't know if this should be blamed on the character or the writing. Either way, it is a too-simple depiction of a too-complicated disease.) And, none of her friends seem to remotely care. Speaking of which, much is made in this show about the way that female friendships are depicted, and that's all well and good, but a secret gem that this season is touting is the way that men interact, as well. 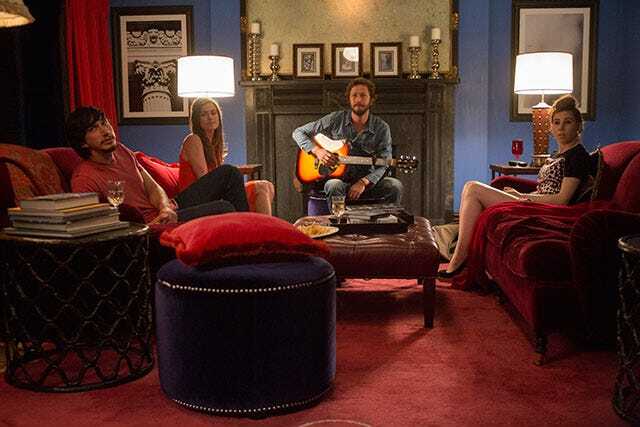 From Ray's desperate bar banter a few episodes back to Adam trying awkwardly to fit in, Girls deftly shows that there is space for women to feel uncomfortable about their relationships with one another but not really men. Adam, perpetually awkward, shuffling Adam, is a great example of the misplaced male desire to be accepted, and the second that Desi shows friendliness to Adam, he opens up to his warm, bearded man-embrace. This episode went to great lengths to depict the fact that everyone — from Patti to Shosh to Elijah — thinks that Adam getting a part on Broadway means his dreams are coming true. (Hannah feebly offers that everyone has achieved their own dreams, which is interesting because they are all sitting in a gorgeous suite that she manages to get for free because of her work.) Everyone is anticipating the fame and fortune that Adam will achieve, except, of course, Adam. It just appears he wants to do a good job. Intentionally or not, be it the dress montage or the fact that it is actually Hannah who nets the hotel, she has her own reasons to feel proud. But, instead, the once un-jealous Hannah is showing her green side. Question: Do you think she is jealous of Adam or the fact that he is doing what he set out to do? From where I am sitting, mere blocks from their apartment, I think it is neither. It seems that she may be worried that Adam will have something else outside of her. Something that Caroline said a few episodes back sticks with me. Adam is always around during a crisis, but not during less-challenging circumstances. What happens when Adam has something to focus on besides Hannah? When he is no longer her "fixer," and she is no longer the vessel in which he pours all that feels too big for him to handle? Remember the road trip episode where he sheepishly tells Shosh that Hannah is his best friend? What happens when another friend or passion project or Broadway role steps into his life? More importantly, what happens when Hannah no longer needs him to dote? Are they mature enough to deal with the banal? You know what? I honestly hope so. The sweetness that exists between the two feels both honest and real. Also, A+ for the Blue Crush reference. Michelle Rodriguez surfing makes so much sense to me.